（C）2010 Universal Studios. ALL RIGHTS RESERVED. 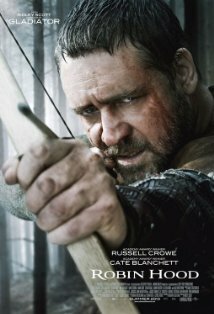 It is 1199 and Robin Longstride (Russell Crowe) is a common archer in Richard the Lionheart's (Danny Huston) army. A veteran of the Third Crusade and Richard's war against Philip II of France (Jonathan Zaccai), he now takes part in the siege against Chalus Castle. Following the death of Richard the Lionheart, Robin and two other common archers, Alan A'Dale (Alan Doyle), Will Scarlett (Scott Grimes), as well as soldier Little John (Kevin Durand), attempt to return to their homeland, having spent ten years fighting abroad. Along the way they come across an ambush of the Royal guard by Sir Godfrey (Mark Strong), an English knight with French allegiance. Philip of France had ordered Sir Godfrey to assassinate Richard. Having discovered the King is already slain, Sir Godfrey is chased off by the arrival of Robin and his companions. Aiming to return to England safely and richer in pocket than when they left it, Robin and his men steal the armour of the slain knights and head for the English ships on the coast under the guise of noblemen. Before leaving the scene of slaughter Robin promises a dying knight, Robert Loxley (Douglas Hodge), to return a sword to the man's father in Nottingham. Upon arriving in England, Robin (who has assumed the identity of Loxley) is brought to London and chosen to inform the Royal family of the King's death and witnesses the coronation of King John (Oscar Isaac), who is the younger brother of the recently-deceased Richard. The arrogant King John shows no remorse to his poor Kingdom and demands harsh taxes to be collected, sending Sir Godfrey off to the North with the task of raising revenue. Unbeknownst to King John, Sir Godfrey is an agent of the French King and uses this Royal Decree to stir up enough unrest, using French Troops, to cause Civil War in England. Robin and his companions head to Nottingham, where Loxley's old and blind father Sir Walter (Max von Sydow) asks him to continue impersonating his son, in order to prevent the family lands being taken by the crown. Loxley's widow, Lady Marian (Cate Blanchett), is initially distrustful of Robin, but soon warms to him when he recovers taxed grain for the townsfolk to plant. Meanwhile, Godfrey's actions have stirred up the northern Barons, who march to meet King John, and demand the signing of a charter of rights. Having realized Godfrey's deception, and knowing he must reunite his people in order to meet an imminent French invasion, the King agrees. A battle follows shortly where Godfrey's men are interrupted while ransacking Nottingham, and chased off by Robin and the northern Barons. In the midst of the battle, Sir Walter is slain by Godfrey. The film climaxes with an invasion on England's south coast by the French, who are met as they land by the English army. The English are victorious in the ensuing battle. Godfrey attempts to flee on horseback, but Robin puts an arrow through his throat from long distance, presumably killing him. However, King John perceives the French surrendering to Robin, rather than to himself, as a major threat to his power. In the final scenes, King John reneges on his word to sign the Charter of the Forest, burns it, and declares Robin to be an outlaw. In response to this, Robin moves to Sherwood Forest with Lady Marian and his friends to form what will become the Merry Men of Sherwood Forest.